from the studio of dorothy donna parker: * Help! I've eaten tooooo much!! It's 10:00 pm. Exploding is a definite possibility! The morning began by the fire drinking coffee which quickly turned into Tom and Gerry's. Rum is involved. It was 8:45 AM. Two of those before breakfast .... well ... need I say more. After gift opening, we moved on to Champagne served with eggs benedict. You will notice I did not say eggs benedict served with Champagne. By 12:30 I was sizzled! .. or was it sozzled!! Had to have a nap prior to navigating the roads to my friend's home for din din. Is anyone out there familiar with Tom and Gerry's? Jean tell's me it's an old and very secret family recipe. I will try and squeeze it out of here later. As I said, they involve rum - quite a lot of rum. : ) Eggs as well. Photos follow. If anything rings a bell - send me the recipe please! As I said, after that it was nap time to recover. Then off to my girlfriends for din din. The deal is, I cook, she cleans up. Just the way I like it. I actually miss cooking beautiful Christmas dinners and very much enjoyed cooking this one. I think I was doing OK until I ate the fresh blueberry pie and cream! Who can say no. My friend loves the vintage/retro look and books. Her place is so warm and cozy. 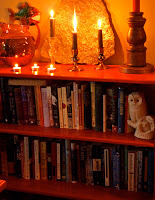 Lots of candle light always adds to the ambiance. So here I am back home. Christmas is over for another year. Tomorrow, I consider a transition day. I have been focused on the Holiday Season. Tomorrow, I will try and finish knitting my caterpiller (wrap) and take it off the needles. After that I only have the fringe to put on and it will be ready to go. While I knit tomorrow - I will refocus my thoughts toward the new year and getting ready to leave for San Miguel. However ..... that's tomorrow. Hope everyone spent a wonderful day.